Stay Out Of The Hallways, Get To Class! 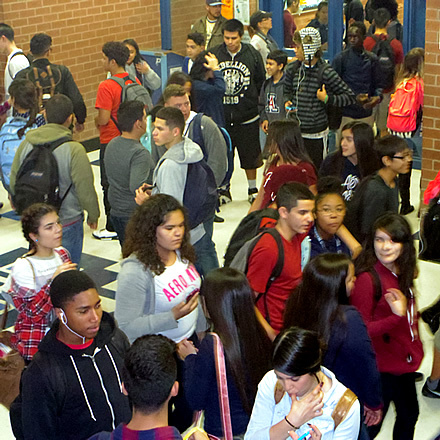 Student traffic in the halls and excessive tardiness have always been a colossal problems at Pueblo, but these problems escalated to new disturbing levels this school year—due in part to a lack of security. Administrators and faculty here at Pueblo have been working diligently to resolve these issues throughout this first semester. Monitors, too, are doing all that they can to ensure that students make it to their classes on time, but because we are short-handed two monitors at the moment, tardies are becoming excessive this school year. Currently, Pueblo has just four monitors, the least amount in recent years. Teachers, too, are becoming increasingly extremely frustrated about the abundance of tardies. While some students are excused for being absent and tardy, many others do not get excused which sometimes leaves the tardy as an absence. “Students need to know the rules of this school and take responsibility for their own actions and their own learning,” said attendance clerk and office manager Ms. Rosalie Sinteral. Most students at Pueblo want their peers to be in class during class time and use their passing periods wisely and responsibly. Next Next post: Pueblo Cheer, Start Packing Your Bags for California!